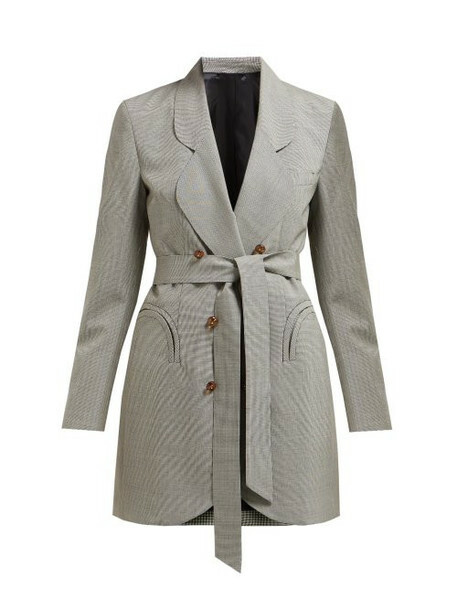 Blazé Milano - This grey Tonino blazer is accented with Blazé Milano's signature smiley pockets - two curved, double-welted features that are a statement of the fine Italian tailoring behind them. It's made from houndstooth-checked wool and defined with a double-breasted front with amber-tone buttons for an antique finish. Cinch it with the detachable tie to accentuate the waist over the elongated silhouette before styling it with a tank top and a leather midi skirt.